Hifonics BRX4016.1D Brutus 4000 Watt Mono Amplifier Car Audio Class-D Amp by Hifonics at All Seven Seater Cars. MPN: BRX4016.1D. Hurry! Limited time offer. Offer valid only while supplies last. Hifonics 4000 watt Brutus Super D-Class mono subwoofer amplifier with unique ParaQ electronic crossover circuit and diagnostic bass remote included. Hifonics 4000 watt Brutus Super D-Class mono subwoofer amplifier with unique ParaQ electronic crossover circuit and diagnostic bass remote included. 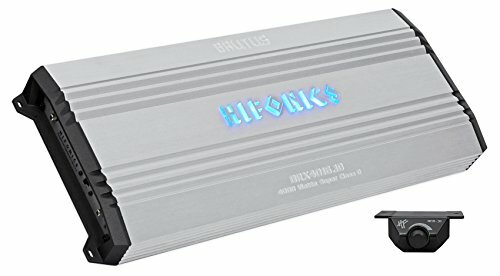 Hifonics BRX4016.1D Brutus 4000 Watt Mono Amplifier Car Audio Class-D Amp. Heat Sink: Aluminum - Heavy duty aluminum alloy heat-sink & Lighted connectors and blue wash of light from the underside of the heat sink. Power Supply: T3 Power Supply - Hifonics T3 (Twin Turbo Toroids) power supply keeps voltage constant through the Ultra-Fi output devices. Strapping: Yes - Power Strapping allows the installer to Sync the input signal and output power to double rated output of a mono amplifier to drive a single or group of subwoofers. Driving subwoofers with this method doubles the available power to the overall bass system, while insuring each subwoofer receives the exact same power level. CONSULT PROFESSIONAL INSTALLER. Bass Remote: Diagnostic, Illuminated Bass Remote Included - Wired Bass Remote allows adjustments to bass frequencies from the control which can be mounted anywhere in the vehicle. Smooth potentiometer and ringed illumination in a satin black mount create a custom look. Speaker Output Connections: Nickel-Plated Brass - High temperature impact resistant with hex screw terminals that allow for secure connections and is erosion resistant. Connections Type: Illuminated, Molded and Angled - Secure connection for all Power, Ground and Speaker connections. Illuminated and angled for ease of access during installation. Signal Pass Through: Yes - One pair of Tiffany style connectors for a full range, L & R output allow distortion free signal to be passed through this amplifier to feed that signal to other components without the need for noise generating Y cables. Diagnostics: 4-Way System Protection Circuitry - Monitor thermal, overload, DC, and speaker short protection with lighted indicators on the amplifier end panel. Illumination: Illuminated Logo - The Hifonics logo illuminates when the amplifier is powered, making a #PowerFromTheGods statement in the dark.